Travel writing is a double-edged sword. Sure, you get an all-expenses trip to some exotic destination that has your friends turning green with envy. But not all places or experiences inspire you to produce magical copy that conveys their charms without it coming across like a hardsell. And even fewer move you profoundly, like the jungle train ride – a 526-km track that serves remote rural towns along the East Coast – did. I turned in the piece in record time. The article practically wrote itself. “All too soon, the Wakaf Baru sign comes into our line of sight, signalling the end of our ride. My wind-whipped hair looks like a lion’s mane, my throat is horase from all that screaming in the tunnel, and my head is swimming when i stagger off the coach like a drunken sailor. “Told you you’d be a bit woozy after the ride,” Suhaimi teases. 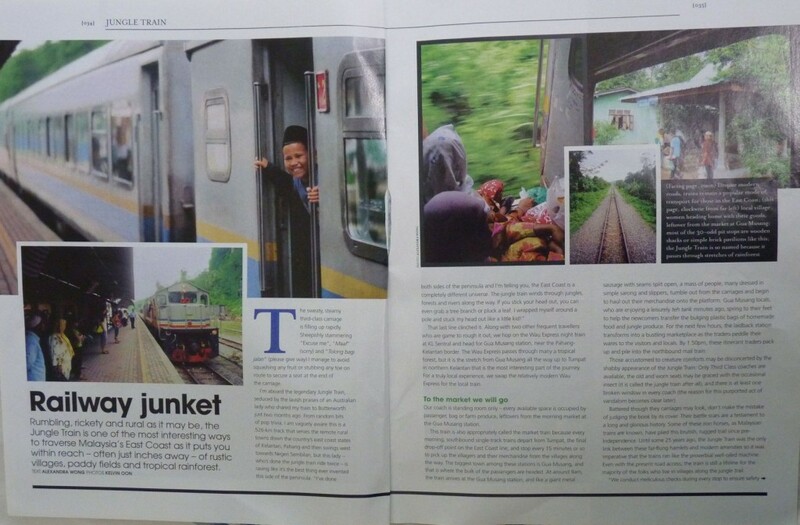 “It happens to people who are unacustomed to riding in a fast-moving train four hours straight. Even re-typing that gives me goosebumps. Can you imagine the profound impact it had on me?